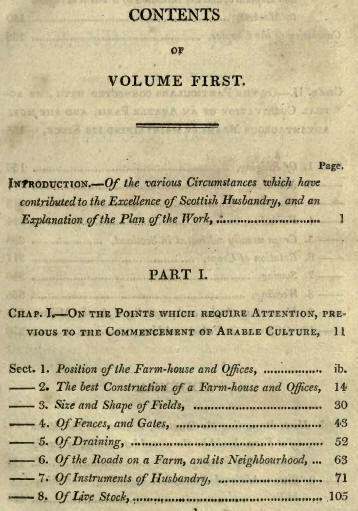 I HAVE at length the satisfaction of laying before the Public, an Account of the Systems of Husbandry adopted in the more improved districts of Scotland. It was drawn up at the request of a most respectable friend, (Sir Joseph Banks), who thought, that such an investigation would be productive of beneficial consequences to the agricultural interests of the united kingdom; and he urged, that it was incumbent upon a native of Scotland, while presiding at the Board of Agriculture, and possessing all the means of information which that situation afforded, to undertake the task. Being occupied with many other avocations, nothing but the respect which I entertain for the opinion of so zealous a friend to improvement, could have induced me to engage in so arduous an attempt. Indeed, the labour and difficulties attending it, have gone far beyond every idea I could have formed of them. To execute the task in a satisfactory manner, it seemed to me necessary, personally to examine several of the more improved districts in Scotland, to converse with the farmers in their own fields, to explain to them distinctly, not only the general objects I had in view, but also the particular facts I wished to ascertain; and to obtain from them, not hasty answers, to questions suddenly put, but details, maturely considered, and carefully drawn up. The reader has now an opportunity of examining the result of the whole investigation. The Author claims the merit only of collecting, condensing, and digesting, the important information which was most liberally furnished. The credit of the knowledge which this Work may contain, belongs entirely to the intelligent and public-spirited Farmers from whom that information has been derived. I cannot submit this work to the consideration of the Public, without congratulating my country, on the anxious desire to obtain agricultural knowledge, which now so universally prevails in every part of the united kingdom. Indeed, when I consider that zeal for improvement, and that thirst for useful information, by which the British Isles are, at this time so peculiarly distinguished, I cannot entertain a doubt, that Agriculture will soon reach a degree of excellence in this country, which it has never hitherto attained in any other: and that the merit of discovering the most effectual means, "of providing food for man," the first of all political objects, will, in future ages, be attributed, to the skill, the spirit, and the enterprise of British Farmers. 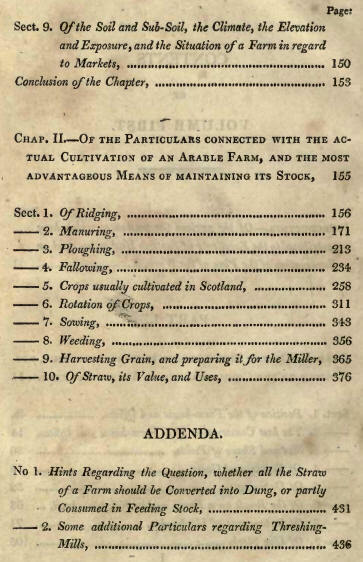 FROM the anxiety to obtain Agricultural information, another Edition of the Husbandry of Scotland has become necessary. In preparing it for the press, every endeavour has been made to render it as correct as possible, and to explain several particulars which had not been sufficiently discussed in the former impression. The Author more especially alludes to the subject of Straw, the importance of which cannot be too highly estimated, but which had not been treated of at much length, either in the First Edition of this Work, or in any former Publication.